In part three of my Azure Data Factory series I showed you how the lookup activity could be used to return the output results from a stored procedure. In part one you learned how to use the get metadata activity to return the last modified date of a file. In this blog, we are going to use the if condition activity to compare the output of those two activities. If the last modified date of the file is greater than the last execution date (last time the file was processed) then the copy activity will be executed. In other words, the copy activity only runs if new data has been loaded into the file, currently located on Azure Blob Storage, since the last time that file was processed. For this blog, I will be picking up from the pipeline in the previous blog post. Therefore, this pipeline already has the get metadata activity and lookup activity and I am going to add the if condition activity and then configure it accordingly to read the output parameters from two previous activities. 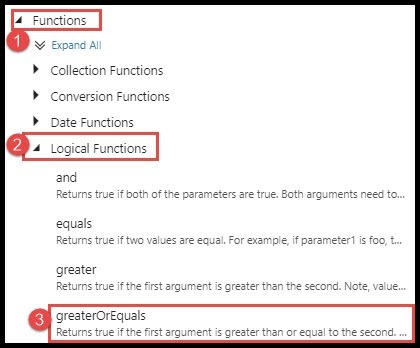 Expand the category Iteration & Conditionals in the activities pane. Select the if condition activity. 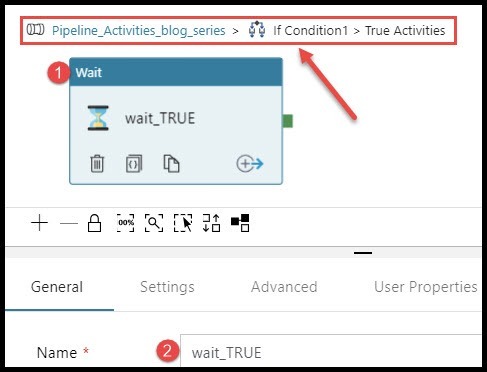 Drag the if condition activity from the activities pane and drop it into the pipeline. Click the hyperlink that appears below the expression box “Add dynamic content”. In the Add Dynamic Content window there are some built in system variables and functions that can be utilized when building an expression. In this blog post I am going to use the built in function greaterOrEquals. This function will allow us to compare the two dates from the output parameters of our previous activities (Last Modified date and Last Execution date). Next click to expand logical functions. Finally, click on the function greaterOrEquals, this function will now appear in the expression box. Now it’s time to finish building out the expression. The built in function, greaterOrEquals, expects two parameters separated by a comma. This is where I will insert the output parameters from the lookup and get metadata activities. As previously mentioned, the dynamic content window will help in referencing those outputs. In the animated gif below, you can see that I use the activity outputs to begin the parameter reference. Then I manually complete the expression by adding the specific parameter names. Remember, that we obtained these names by looking at the output of each activity after debugging the pipeline. The final step is to add activities to if condition activity. You have two options under the activities tab. These options are If True activities and If False activities. In other words, what activities would you like to perform if the expression evaluates to true? Alternatively, what activities would you like to perform if the expression evaluates to false? For the sake of simplicity I will add a wait task to each activity condition. In the next blog post in this series I will replace the wait activity with the copy activity. Click on the Activities tab found in the properties window. This will open a pipeline that is scoped only to the if condition activity. Add the Wait activity to the new pipeline. I named the activity wait_TRUE to help during debug and validation. Also, pay special attention to the breadcrumb link across the top of this pipeline. This makes navigation easy and also helps identify what scope you are currently developing in. As mentioned previously, the wait activity that was added is scoped to the if condition activity and only if the expression evaluates to true. I want to add a final activity before debugging the pipeline. I want to add a wait activity to the if condition if the expression evaluates to false. To do this I have to navigate back to the if condition activity and select If False Activities under the activities property. I will use the breadcrumb link to navigate back to the main pipeline. Then select the Activities tab for the the If Condition activity. Finally, click the box for “Add If False Activity”. With everything set up it’s now time to debug the pipeline. Since the last modified date of the file is 06/06/2018 and the last execution date is 06/13/2018, therefore, I would the wait activity defined within the If Condition-If False pipeline should be executed. As you can see from the results below, the wait_False activity was executed. Great post, quick question though… don’t you need to CAST the Lookup and Get Metadata values to either Date or Integer and then compare? it’s funny but the way I solved this is by adding this to the lookup parameter. Hey Saul! Thanks for the feedback and the link. The example that I shared in this blog post works without having to change any data types. I am really curious why your example doesn’t work and would like to recreate the problem on my end. I sent you an email with details, thanks again! Hi Mitchel, I think you wanted to post the wait_FALSE activity screenshot the second time when you duplicated the True activity with wait_TRUE event. Thanks your blog post, it’s great!